Nothing beats fresh out of the oven cinnamon rolls. Those rich, sweet, buttery, spiraled pastries filled with aromatic cinnamon, sprinkled with nuts and dripping with sugar glaze. Add a steaming hot cup of coffee and it’s a decadent way to start any day. Did you know that cinnamon buns are celebrated in Sweden? Yes, we just might have the Swedes to thank for inventing this inviting indulgence. They’re just about a part of daily life there. In fact, October 4 is Kanelbullens Dag (Cinnamon Bun Day) in Sweden. You are getting two for one with this recipe. 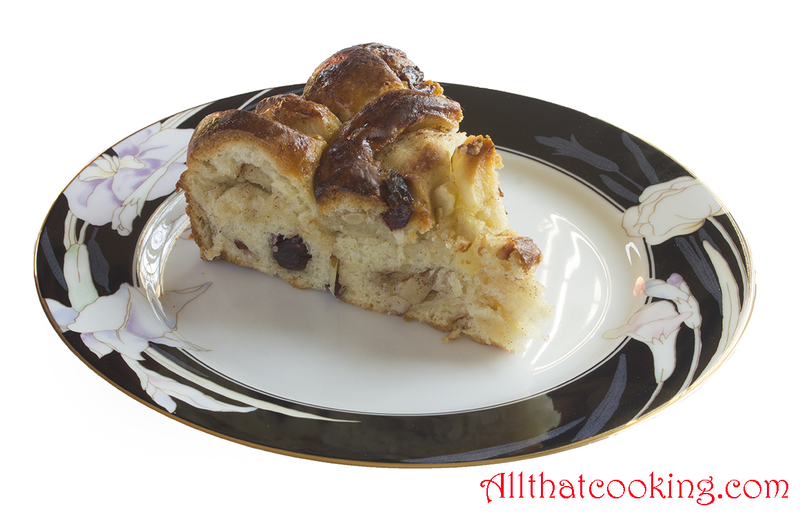 After you prepare the cake, you might have left overs which are the traditional Swedish cinnamon rolls. Pop them on a buttered cookie sheet and bake for about 12 minutes. Now, where is that cup of coffee?. . .
We’ve listed the filling, egg wash and sugar glaze recipes first. It’s your choice. You can make the filling and egg wash, and reserve them until ready to use. You can also choose to make them while the dough is rising. You should choose a good baking apple like a Granny Smith or Honey Crisp that will hold up to oven heat and not get mushy. The sugar glaze is a no brainer. Make this when the cake has cooled. 1. In a small bowl, mix together sugar and cinnamon. 2. In a medium bowl, toss together apples, craisins or raisins and almonds. 1. In a small bowl whisk together egg yolk and milk. 1. In a small bowl, mix together sugar, water, lemon juice. There should be no sugar lumps. Mixture will be thickly runny. In a small bowl dissolve yeast in milk. 1. Place flour, sugar, cardamom, salt and butter in bowl of stand mixer fitted with dough hook. Mix until no butter clumps remain. 2. 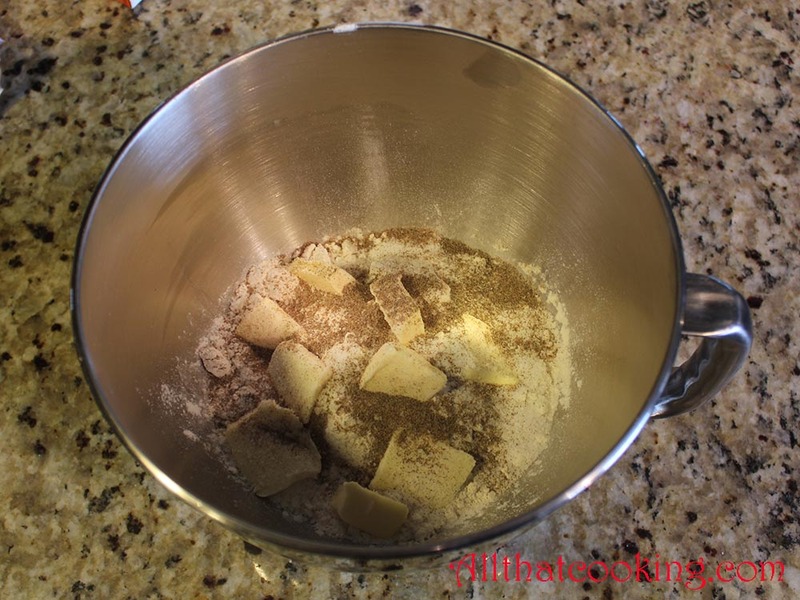 Pour yeast mixture into flour mixture and mix until dough is smooth and pulls away from sides of bowl. 3. Cover bowl with a damp cloth and allow dough to double in size. 5. 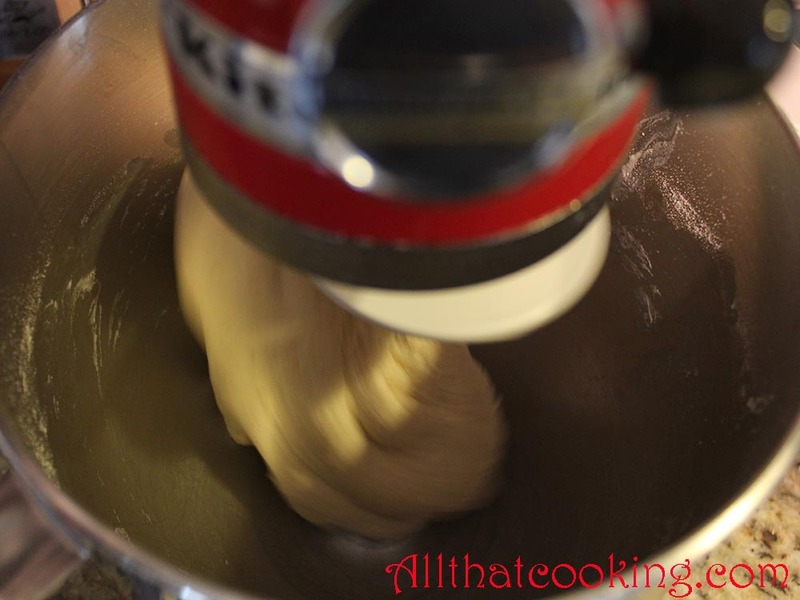 On a clean, floured surface, roll out dough to about 15-inches by 12-inches. Get reserved filling mixture and evenly spread butter over dough, then sprinkle with sugar and cinnamon mixture. 6. 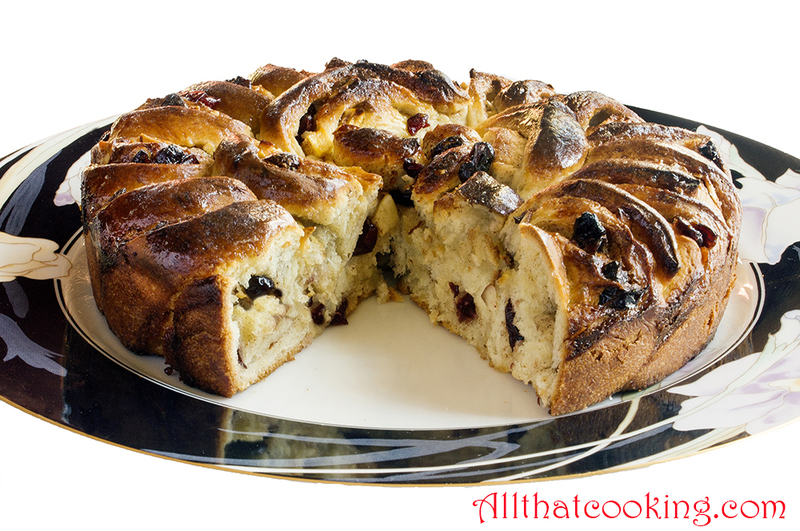 Evenly strew apples, craisins or raisins and almonds over dough. 7. 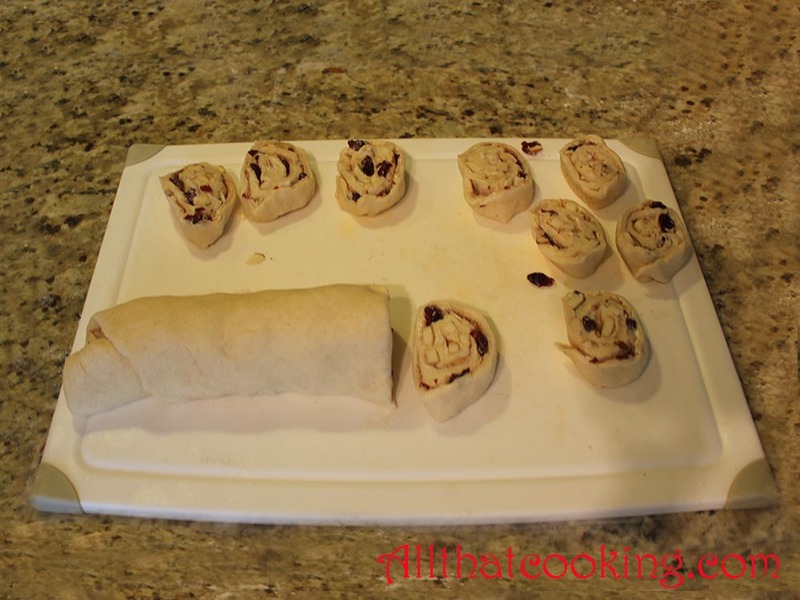 Roll dough, lengthwise in jelly roll fashion then use a sharp knife to cut log into about 20 even slices. 9. Brush top of cake and any individual rolls with reserved egg wash. Refrigerate leftover egg wash for use when cake comes out of oven. 9. Bake cake in preheated 350 F oven 40 minutes. 10. When out of the oven and still hot, brush tops again with egg wash. It adds a nice shiny surface. 11. When rolls have cooled, drizzle with sugar glaze. Gallery | This entry was posted in Breakfast, Desserts, Sweets and tagged cardamom scented cinnamon rolls, Cinnamon Bun Day in Sweden, cinnamon roll cake, Cinnamon rolls, Kanelbullens Dag. Bookmark the permalink. Cinnamon Bun Day! That is great! I wanna live in Sweden where cinnamon buns are elevated by national recognition. And, cardamom! Under-promoted subtle spice elevated to very high status on my palate. Haven’t made this recipe yet, but bet your bottom dollar folks, I shall be making Oli’s Cinnamom (couldn’t resist) Roll Cake come this weekend. Keep doing all that cooking, O & G! Cardamom is my absolute favorite. Never buy the ground stuff in a bottle. Buy the green pods (you can find them in Indian groceries) and grind them yourself. Far superior and the aroma is intoxicating! Now, what time is breakfast this weekend? This is so unique and reminds me of the coffee cakes of my youth. Can’t wait to try it!